Telephone in the Fernmeldemuseum, Bremen, Germany. Antique and Retro Telephones have exploded on the home decor popular consciousness in the US. In the UK, the height of the fad hit a couple of years ago. I think this must be a nostalgic backlash against the speed of technological change. People yearn for clunky, older-styled tech as tech madness pushes forward exponentially. The blog Advice 4U Now just commented on this: "These phones can remind you of days gone by when maybe you would talk for hours to your girlfriend or boyfriend before your parents made you get off the phone. You do remember those days right? With so many things happening in the world lately, sometimes you would just wish to sit back, relax, and spend the day just talking over a retro telephone. 'Say what? Talk on an old phone?' 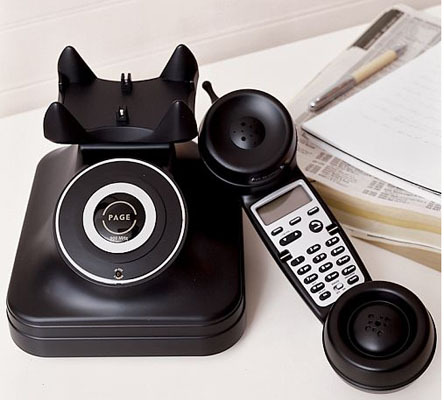 you may say, but many people are getting back to there roots so to speak when it comes to their home telephones and they are going retro. ... Maybe you recognize one of those by name, but you certainly would recognize one of these retro telephones by sight. They may rekindle memories of visiting your grandparents house, or maybe your parents had one. Made from the original case mouldings that were supplied back in the good old days, these rotary dial retro telephones are the real mccoy and better still when you get that first phone call you’ll remember that there’s nothing quite like the original bell ring of this true classic." The site Retrowow has a history of phones from the 1920s to the 1980s and talks about where classic models are still available in the UK. There is a historical website, The Telephone File, devoted to telephone systems in the UK here. Abdy Antiques in the UK repair and remodel antique British telephones ('antique' meaning, anything pre-1987); they also sell replicas of classic phones here. Greygates even makes a Bakelite polish so that you can shine up your vintage telephone. Youtube has several videos made by vintage telephone collectors. The video below profiles the Western Electric model 302, manufactured in June, 1939. Some do-it-yourselfers are dismantling old telephones and refitting current tech into classic phone casings. In the video below, Make Magazine explains how to install a Bluetooth wireless headset into an old phone receiver. Want a modern retro phone? DIY. Video: Kipkay/makemagazine. Modern phones are also being designed in retro styles. Crosley, Golden Eagle and Polyflame are model names for retrokitsch telephones made by Ahern. 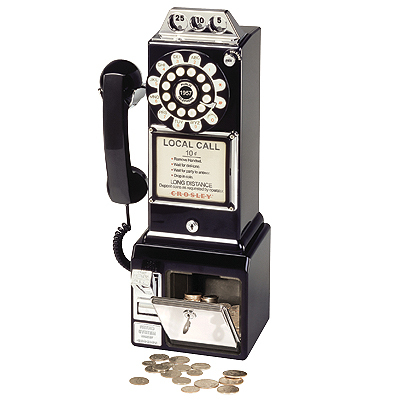 The Crosley offerings even include a 1950s' style payphone (below). One Way Furniture describes it: "The very familiar 3-slot style payphone was first introduced in the 1950’s and remained virtually unchanged until 1965. This appropriately christened 'prepay-style pay station' will take you back to the days of old fashioned phone booths and 10-cent phone calls. Believe it or not, its predecessor was a post pay-style phone that actually allowed the caller to place their call and then pay once finished. While you don’t have to pay for your calls with this Crosley replica, you will enjoy the functional coin slots complete with Crosley jingle as your money is deposited into the coin bank in the base of the unit." The Retro Telephones blog describes the Crosley Candlestick model: "The Candlestick phone, also known as the Upright’ initially became popular during the early 1900s before the introduction of the one-piece handset. 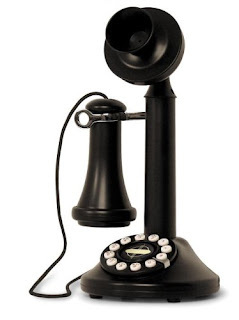 The first Candlestick phones were introduced when the magneto system was in use, which meant that the phone was connected to a large wooden box called a “subset” containing a battery, bell, and crank. But oh have we come a long way. From its bell-shaped mouthpiece to its cloth covered receiver cord, this telephone replica recalls a vintage instrument from the 1900’s. But a closer look reveals some modern technology including a decorative dial that functions as a push button for tone/pulse operation as well as a center medallion that serves as a redial button." The site Hardware has a post about a retro-looking phone (below) that operates with current design: "If you long for the…ahem… ‘good’ old days of people listening to the wireless and times when telephones were luxury items, then you’re bound to have a soft spot for the retro wired telephone, that’s actually wireless." Bang and Olufsen specialize in a 'retro-contemporary aesthetic.' In 2005, they released the Serene mobile phone (below), which has an Art Deco feel about it. 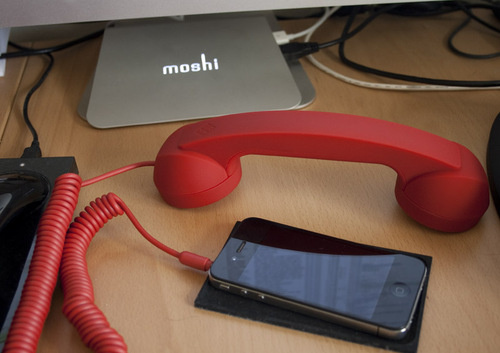 Native Union's Moshi Moshi line makes a retro handset that plugs into a handset, so that you can cradle the phone while you talk (below). Gizmodo has a review here: "This type of gadget really appeals to the Mad Men-watcher in me, even if I'm still stuck halfway through on season 2. Perhaps it's the David Turpin French styling of the MM03 and MM01, but holding these handsets up to my face elevates the importance of every call by at least 15%." Moshi Moshi MM01h (2009). Image: Gizmodo. There are blogs devoted to old telephones here, here, here, here, here and here. Telephones have become a hot collector's item and antique hunters have organized themselves into various historical societies such as Telephone Collectors International, the Antique Telephone Collectors Association ("over 1000 active members are located throughout the United States, Canada, Europe, and Australia"), the Australian Historic Telephone Society and the Australasian Telephone Collectors Society Inc. The Antique Telephone Collecting Webring is here (scroll to the bottom to navigate through member sites). It lists Retrophones (New Zealand); The Classic Telephone Company (Spain); Bob's Old Phones (Australia); The Dutch Online Telephone Museum (Netherlands); Ian McPherson's Kiosk Korner (UK) is devoted to old British telephone booths, including the Tardis-like Police kiosks made famous by the sci-fi series Dr. Who - he has links to other sites about antique phone booths here; Soniarus Vintage Telephones (UK); and the Telephone Museum of Prince Edward Island (Canada). Other devoted sites: Rob's Vintage Telephones (Canada); Antik Telefon (Germany); Alte Telefone (Germany); Fernmeldetechnik (Germany); Vienna Telephon Museum (Austria); Sveriges Telehistoriska SamlarFörening (Sweden); Antiques Telephones (Argentina); Museu do Telefone (Brazil); Japanese Antique Telephones (Japan); Société Générale des Téléphones (France); Téléphoniste (France); Le téléphone Ancien (France). 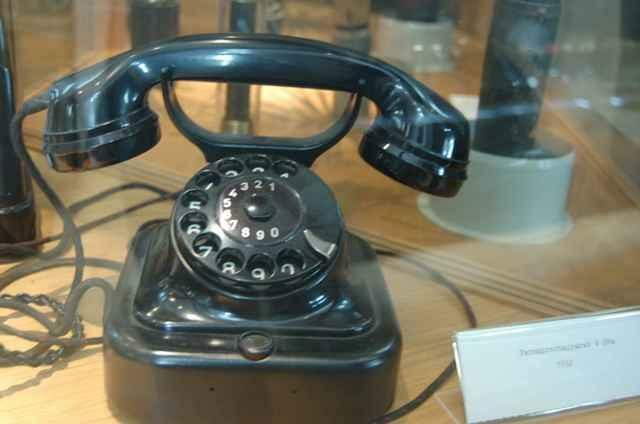 Scroll down at this link for international lists of telephone museums and sites with the history of telephonic communications. Yeah, the 'upright' and the even earlier version of the 1950s phone going back to.....1890s, I think? My parents in the US have had rotary phones since the 1960's. It's impossible to use voice mail or anything with a menu option on them. If you try to dial the number you need to 'press', it prompts no reaction whatsoever. Increasingly, I've found many large businesses and even government offices have no human operators. Those that do often hire operators who are unaware that such technology ever existed and repeatedly direct or transfer callers to prerecorded menus. It would be much less frustrating to deal with them if any of them had an ounce of honesty and simply admitted that they didn't know what a rotary phone is. I'm hopeful that if this technology becomes prolific once again (even if it's only because of some aesthetic choices) that businesses make themselves more accessible instead of treating customers like criminals for using some technology for which the businesses themselves are inadequately prepared. @Jay It's amazing that people are demanding a current version of the upright. @pblfsda I think we live in a transitional period, which is why I put the pictures up of hybrid designs like the plug in hand-held Moshi Moshi receiver that attaches to one's mobile phone. I'm tempted to say that those transitional designs will fall away, but given that people are demanding models of 1950s' payphones as their kitchen phone, it seems that retro styles may last. So what does all this retro kitsch nostalgia mean? Does it only mean something to people who remember the way phones used to be, or will it have relevance to the operator you mentioned, who has no knowledge of older tech? I never directly experienced using an upright telephone from the turn of the last century, but I can appreciate the design and the style. Demand for retro phones may be a way of resisiting the rapid pace of technological change. The candlestick retor phone is so cool... we are in New Zealand - can you please advise where to source one and if they will work here? Cool site by the way! Worse comes to worse, you could buy a US model and then convert the innards to a NZ compatible phone. But you might want to ask Ahern if that's possible. I think antique telephones are so beautiful and unique. No one really owns one anymore. I have a few antique telephones at home. My friends appreciate the beauty of it every time they come over. devices. It's fantastic to know that from the 19th century telephone system it gradually evolved into modern telephony system and smartphones or mobile phones which we now enjoy.